the DNR, Gun Lake Tribe and FWS continue efforts to get sturgeon eggs. There are some eggs and tiny sturgeon in the hatchery in New Richmond. John Bauman from FWS will give an informative tour when he is attending the fish and larvae. As the egg gathering and hunt for fry continues, we're seeing the first activity in the hatching and rearing facility trailer. And today with the aid of a microscope we get a really good "up-close" look at some sturgeon eggs! Remember, you can always visit our web site at www.kazoosturgeon.org for details, more information about our habitat restoration program, and to learn more about our prehistoric pal, the Lake Sturgeon! Our egg and fry gathering efforts continue. 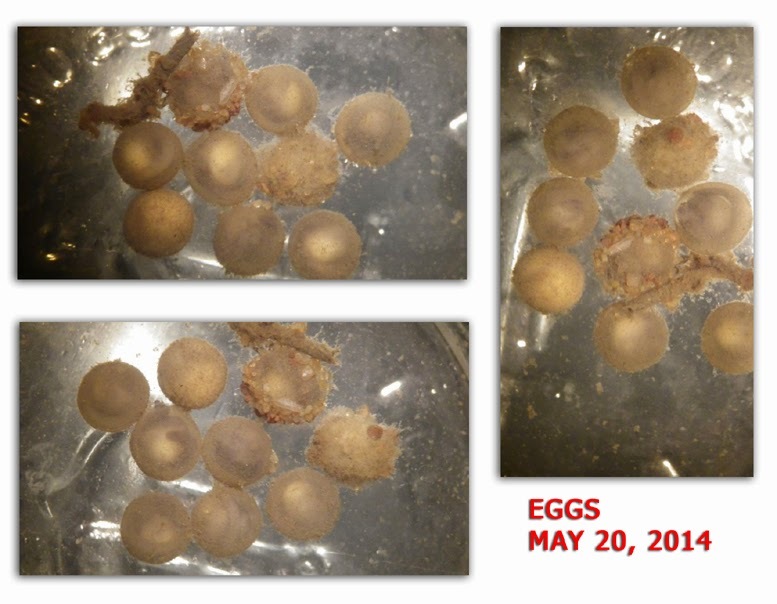 We have been finding some eggs that are now in place in the hatchery/rearing facility trailer. A number of the eggs we've gathered so far are viable and, better yet, some are beginning to hatch! HEY - IT'S STURGEON MOTHER'S DAY TOO! We started celebrating Mother's Day a day early this year! Yesterday, May 10 the DNR folks were able to gather approximately 100 sturgeon eggs from the egg-mat "traps". After sorting, 60 of those are now in the live beaker at the New Richmond hatchery facility. John Bauman of Fish & Wildlife service explains that of those, we can expect a fair number to hatch and grow. There is typically some mortality due to such normally occurring factors such as fungal infections, etc. Our egg mats will be checked again tomorrow, May 12 and our other methods will also be utilized to continue to gather more eggs and live fry. These are the first sign of spawn for this 2014 season however, many adult sturgeon have been caught, examined and re-released this year. From here on out water temperature and other factors will determine the amount of successful spawning that will take place this year.